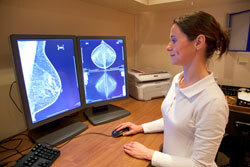 Mammography is an essential step towards early diagnosis of breast cancer. A mammography unit uses x-rays to obtain images of the breast from different angles. This unit exposes only the breast to x-rays and has a device to compress the breast and hold it in position. The American Medical Association and the American College of Radiology recommend that women have annual mammograms and physical breast exams, with a physician, beginning at the age of 40. Women should begin administering self-breast exams at the age of 18 to monitor changes in the breasts. 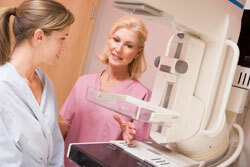 If you have increased risk for breast cancer, annual mammograms may need to begin earlier.